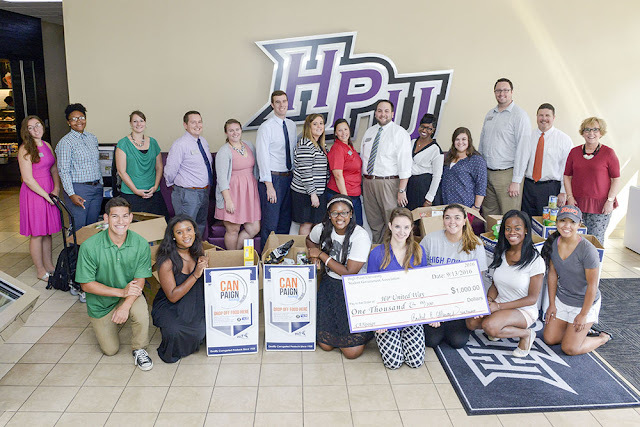 Representatives from High Point University’s Student Government Association and Alpha Phi Omega service fraternity, in addition to staff from the Office of Student Life, present canned food items and a $1,000 donation to the United Way of Greater High Point’s “CANpaign” food drive today. "HIGH POINT, N.C., Sept. 13, 2016 – Leaders from the United Way of Greater High Point were greeted with boxes of food and a $1,000 donation from High Point University students and staff on campus today. As the UWGHP’s delivery truck arrived as part of the organization’s “CANpaign” Kick Off event, the Student Government Association presented the monetary gift. Nearly 1,400 canned food items and additional nonperishables collected by student clubs on campus were also donated. Alpha Phi Omega, HPU’s co-ed service fraternity, was the largest contributor for canned food. SGA President Rachel Callaway said the $1,000 donation and food items were important for students to contribute. In total, the UWGHP expects to collect 100,000 pounds of food today. A celebration and distribution event will be held at the High Point University Community Center at Oak Hollow Mall today at 5:30 p.m. as donations from across the city are packed onto an Old Dominion Freight Line truck. HPU lacrosse players will assist in the final packing, and HPU cheerleaders, Prowler the Panther and the HPU ice cream truck will also be at the event. The HPU family comes together to contribute to this event each year, as well as many other United Way initiatives. The university’s 2015 United Way Campaign totaled $230,000, a 505 percent increase since 2005 and the third largest campaign in the city. The university has also received the Spirit of North Carolina award from the United Way for four consecutive years. At High Point University, every student receives an extraordinary education in an inspiring environment with caring people.® HPU, located in the Piedmont Triad region of North Carolina, is a liberal arts institution with more than 4,800 undergraduate and graduate students. It is ranked No. 1 by U.S. News and World Report for Best Regional Colleges in the South and No. 1 for Most Innovative Regional Colleges in the South. HPU was named the No. 4 private school in N.C. for the best return on investment, and it is a 2016-2017 College of Distinction. The university offers 48 undergraduate majors, 51 undergraduate minors and 13 graduate degree programs. It is a member of the NCAA, Division I and the Big South Conference. Visit High Point University on the Web at highpoint.edu."